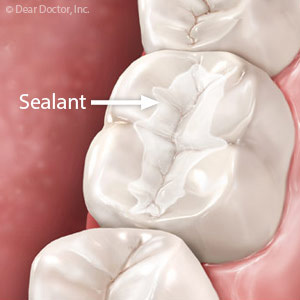 Have you heard about dental sealants? These preventive treatments have been available for many decades, and more and more children are taking advantage of them. The National Institutes of Health (NIH) estimates that around 30% of kids from 6 to 11 years of age have had sealants applied to their molars (back teeth). Sealants are designed to reduce the incidence of cavities by filling in or eliminating the pits or crevices found in all molars, where decay-causing bacteria can hide and your brush can't reach. But do they really work? Now, the research is in, and the answer is clear — YES! Two major studies, each of which reviewed the results of thousands of patients over several years, recently came to the same conclusion: Dental sealants are effective at reducing cavities, and their benefits can last for four years (or more) after application. In general, the studies showed that kids who didn't get sealants were twice, three times, or even more likely to get cavities, compared to kids treated with sealants. Sealants themselves are protective coatings made of plastic resins or glass-like materials. They are applied in liquid form, and then hardened by a special light. When “painted on” to the chewing surface of a molar, sealants fill in the tiny crevices, or “pits and fissures,” that are found there. Uneven tooth surfaces form a perfect breeding ground for the bacteria that cause tooth decay; worse yet, the bristles of a tooth brush can't usually reach them. That's what makes these areas highly susceptible to tooth decay. Applying sealants is a quick and painless procedure that doesn't require any numbing shots or drilling. Many kids start getting sealants when the first permanent molars come in, around age 5 to 7; they may have more sealant treatments when additional molars emerge, between the ages of 11 and 14. Sealants are recommended by the American Dental Association and the American Academy of Pediatric Dentistry, and have only a modest cost per tooth. On the other hand, having a cavity filled generally costs substantially more, and may result in more trouble (and expense) down the line — so sealants can make sense economically, as well as preventively. This is especially true for those at high risk for tooth decay. The best way to prevent dental visit anxiety in your children is start those visits around their first birthday, and continue with them through childhood. Age One visits are the best way to ensure they're comfortable with the dentist now and that they'll continue the habit into adulthood. But in spite of your best efforts and those of your dental provider, there's no guarantee your child won't experience dental visit anxiety at some point. If that happens, we recommend conscious sedation. Conscious sedation is the use of certain medications to help a patient relax. It's not the same as anesthesia, which eliminates pain by numbing tissues (local anesthesia) or inducing unconsciousness (general anesthesia). During conscious sedation a patient remains awake or at the most in a dream-like state, can still respond to touch or verbal commands, and although monitored doesn't require assistance in heart or lung function. We can induce this relaxed state in a number of ways: orally, with medication given by mouth a short time before the visit; intravenously, the medication delivered through a drip directly into the bloodstream; or by inhalation, usually nitrous oxide gas mixed with oxygen and delivered by mask. Oral sedation is the most common. On the day of the procedure, we'll give your child one or more sedative drugs, usually in syrup form. For best results we advise they eat a low-fat dinner the night before and not eat or drink any food or liquid afterward. We typically use Midazolam and Hydroxyzine, both of which are proven safe and fast acting. During the procedure, we'll also assign a team member to monitor their vital signs while they're under the influence of the drugs. We may also employ special positioning or immobilization equipment to keep movement to a minimum. After the procedure, we'll continue to monitor vitals until they return to pre-sedation levels. The child should remain home the rest of the day to rest and return to school the next day. Conscious sedation is regulated by states: providers must be trained and licensed to administer sedation drugs with continuing education requirements. Even so, the use of sedation for children is becoming more widespread and helps to safely ensure they're getting the dental care they need. Your family uses fluoride toothpaste and your drinking water is fluoridated too. So with the fluoride your child already takes in, is it really necessary for topical fluoride treatments during their regular dental visits? The answer is most definitely. Fluoride has a unique ability to strengthen enamel, your teeth’s protective cover against decay and other diseases. It does this by infusing itself in the enamel structure and making it that much more resistant to acid attack and decay. This infusion occurs in two ways. First, growing teeth obtain it through the bloodstream as they incorporate other minerals that make up the enamel structure. The very small amount of fluoride added to drinking water — as low as one part per million (ppm) — imparts sufficient fluoride to developing teeth. In the absence of fluoridated water, dietary fluoride supplements can achieve the same effect. The second way is just after the teeth have erupted and are still quite young. In this case, fluoride coming in direct contact with the enamel surface is absorbed, resulting in changes to the enamel’s crystalline structure that will create added strength. This can occur to a limited degree through fluoride toothpaste or other dental products. The concentration of fluoride in these products, though, is relatively low (850-1500 ppm) as mandated by the U.S. Food and Drug Administration for safety. Professional applications, on the other hand, are much higher — 12,300 to 22,600 ppm depending on their form. They’re applied, of course, under strict clinical guidelines to cleaned tooth surfaces, usually as a gel, foam or varnish. The latter form will often continue leaching fluoride into the enamel for a month or more. These topical applications can greatly strengthen the teeth of children who don’t have the benefit of fluoridated water or may be at higher risk for dental disease because of socio-economic conditions. But they can still be helpful for children with adequate fluoride exposure and low risk factors for disease. At the very least, fluoride treatments can give your child an added boost of protection as their teeth continue to develop. Like any parent you want your child to grow up healthy and strong. So be sure you don't neglect their dental care, a crucial part of overall health and well-being. The most important part of this care is prevention — stopping dental disease and other problems before they do harm. Proactive prevention is the best way to keep their teeth and gum growth on the right track. 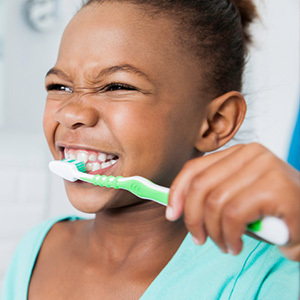 Prevention starts at home with a daily habit of brushing and later flossing. In the beginning, you'll have to brush for them, with just a smear of toothpaste on the toothbrush. As they get older, you can teach them to brush for themselves, graduating to a pea-sized dose of toothpaste. It's also important to begin regular dental visits around their first birthday. Many of their primary (baby) teeth are coming in, so regular cleanings and checkups will help keep tooth decay in check. Early visits will also get them used to seeing the dentist and hopefully help stimulate a lifelong habit. These visits have a number of purposes. First and foremost is to monitor dental development and early detection of any emerging problems, like a poor bite. Catching problems early could help reduce or even eliminate future treatment. Some children are also at greater risk for tooth decay and could benefit from applications of topical fluoride, a mineral that strengthens tooth enamel, or a sealant to help protect the teeth. This is especially helpful in preserving primary (baby) teeth: early loss of a primary tooth could disrupt the permanent tooth's eruption and cause a poor bite. 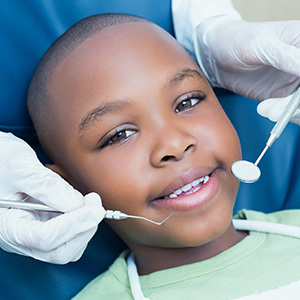 Your child's dental visits could also benefit you as their caregiver. You receive regular feedback on how well your child's teeth and gums are developing, and the effectiveness of their oral hygiene. You also get answers to your questions about their oral health: the dentist's office is your best source for advice on teething, diet and other issues. Together, you and your dentist can provide and maintain the best conditions for your child's dental development. The result will be the healthiest mouth they can have as they enter their adult years. If you would like more information on preventive dentistry for your child, please contact us or schedule an appointment for a consultation. There’s a potential threat lurking in your young child’s mouth—tooth decay. This destructive disease can not only rob them of teeth now, it could also impact their dental health long into their adult years. That’s why we focus heavily on decay prevention measures even in primary (“baby”) teeth, as well as early treatment should it still occur. It’s a straightforward treatment strategy: minimize the factors that contribute to disease and maximize those that protect against it. We can represent the disease-causing factors with the acronym BAD. Bad bacteria top the list: they produce oral acid that erodes tooth enamel. Couple that with an Absence of healthy saliva function, necessary for acid neutralization, and you have the potential opening for tooth decay. Poor Dietary habits that include too much added sugar (a prime food source for bacteria) and acidic foods help fuel the decay process. But there are also SAFE factors that can help counteract the BAD. Promoting better Saliva function helps control acid levels, while Sealants applied to chewing surfaces strengthen these vulnerable areas against decay. We can prescribe Antimicrobials in the form of mouth rinses that reduce abnormally high bacterial concentrations. Fluoride applied directly to the enamel bolsters its mineral content. And an Effective diet high in nutrition and low in sugar or acidic foods rounds out our protective measures. Promoting SAFE factors greatly reduces the risk of childhood tooth decay. To keep on track it’s important to start regular, six-month dental visits beginning around your child’s first birthday. These visits are the most important way to take advantage of prevention measures like sealants or topical fluoride, as well as keeping an eye out for any signs of decay. And what you do at home is just as important. Besides providing a teeth-friendly diet, you should also brush and floss your child’s teeth every day, teaching them to do it for themselves when they’re old enough. Playing it “SAFE” with your child’s dental health will help ensure your child’s teeth stay decay-free.